About Woodside Road The club have been playing at Woodside Road (aka The A2B Stadium) since 1900, and once hosted a crowd of over 3,600 for a FA Cup game. 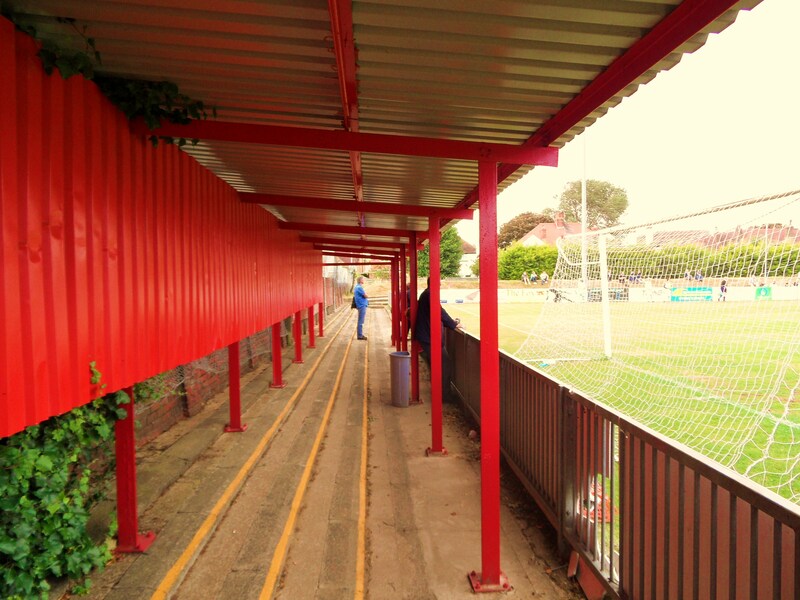 After the main stand burnt down in 1985, the club have rebuilt the ground into one of the best in the Isthmian League. I will let the words of the illustrious Nomad Online describe the ground. The impressive main stand which is situated along the near touchline, dominates the ground. The current stand also houses dressing rooms and function areas, as well as the Rebels’ Tavern. Because of this design,the seating is reached by steps leading up from the touchline. In late September 2004 the new stand was evidently within minutes of falling to the same fate as its predecessor, when a leak from an automatic glass cleaner onto electrical cabling caused a fire that completely gutted the Tavern. Fortunately the fire was discovered just in time, but the damage left the Tavern out of action for several months afterwards. For those wishing to stand, an alternative to the grandstand is provided on the touchline opposite, between the two dugouts. The story goes that there was originally a large static water tank on the site during WW2 to combat the threat of incendiary bombs. This was then converted into a training area, and was subsequently sold for development. The small covered area that now faces the main stand was evidently built as a gesture by the developers, and has since been considerably improved since (see Bob Lilliman’s archive photograph). Behind and to either side of the cover is a grass bank that extends for most of the touchline, although there is also a small area of terracing at either end. Although standing on the bank is prohibited (with signs reminding spectators of this fact), it remains a popular vantage point for Worthing’s annual pre-season friendly against Brighton & Hove Albion. However, this is not something to be recommended in winter! There are further covered areas at each end of the ground, with the main clubhouse behind the main entrance in Woodside Road. Floodlights were installed in 1976, and on two sides of the ground there is extensive netting to catch wayward clearances. All in all, a cracking ground and one of the very best in the county.How to get to Woodside Road Follow A24 past the Black Horse pub on your left and keep driving past the Jet petrol station which will also be on your left. At the round-about, take the 2nd exit into Offington Lane. Remember that this is a 30mph road (watching the camera on your left) and carry on driving south. Continue to go straight on through the Thomas a’ Beckett traffic lights (you’ll see the pub on the left corner). Follow the road round and go straight on at the first mini-roundabout. About 100 meters along you’ll see another mini-roundabout, take a left here into St. Lawrence Avenue. There’s another mini-roundabout which you should go straight across. 150 meters along there’s another mini-roundabout, this time take a right down Nutbourne Road and continue going straight (negotiating the s-bend!) to the next junction…you’ll be able to see the stadium & floodlights now. Take a left down Bulkington Road and Woodside Road will be on your right in about 250 meters time although now would be a good time to park your car as Woodside Road itself gets very busy on match days. Being a residential area, parking is tight. On match days, driving/parking down Woodside Road is not advisable. Try the roads situated around the ground: Bulkington Avenue, Nutbourne Road, Shermanbury Road, Gaisford Road, Woodmancote Road and at a possible Henty Road though this will get busy. The Ground is half a mile from Worthing (BR) Central station. When you come out of the station, take an immediate right and walk parallel to the train-line down Cross Street. About 100 meters down the road, you will see a train crossing. Turn right here into South Farm Road. Take the next left down Pavillion Road and walk along here for about 400 meters where you should start to be able to see the floodlights. You will see Woodside Road on the right and the ground is about another 200 meters on the left.Thanks to the club for providing the above directions.How to get a ticket for Woodside RoadThe ground has a capacity of 4,000 and with an average attendance in the past few years of around 300 you will not struggle for a ticket. Adults are £9, children free if they come in with adults, otherwise £4. If you want to sit in the main stand then it is another 50p. Programmes are £2.Worthing 0 Lewes 0 – Woodside Road – Saturday 17th July 2010 What a fine turnout there was for this game. West Sussex met East Sussex and the fans came out in force. It is rare that pre-season games attendances top average league ones but there was a good few hundred in the ground for this one. Our numbers were boosted with guest appearances from Pete Styles, creator of the Cup of Good Hop blog as well as Mr Brook who had recently become a father – no guesses for his new son’s middle name (Clue – look at the away team name….). Five pounds to get in was a bit of a bargain although the club did miss a trick in not allowing fans to take their beers outside. 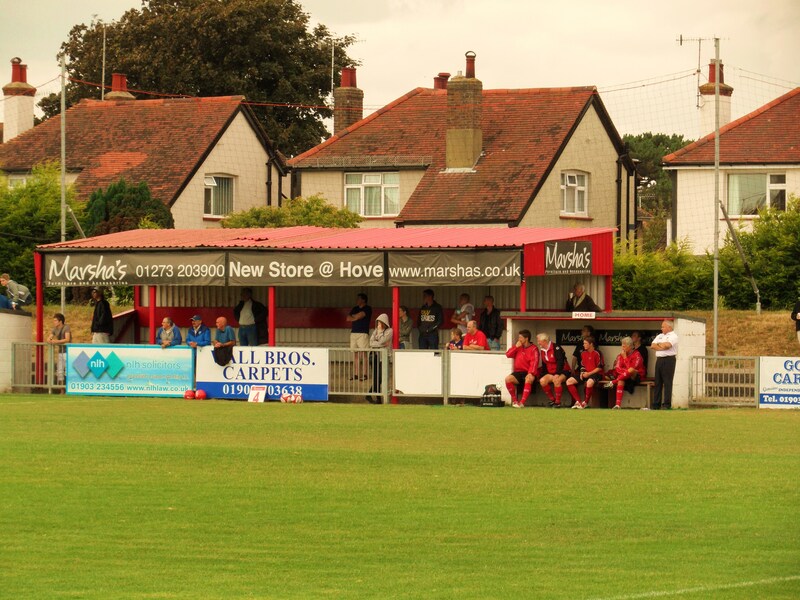 I was suitably impressed with Worthing’s ground – certainly worthy of higher football. The main stand was very reminiscent of Swindon Town or Bristol City, but most fans headed for the terraces and grass banks to watch the game. One familiar face in the crowd was Ryan Storrie. Regular readers will remember that Ryan was the TBIR sponsored player at Lewes last season before quitting the club in the New Year to gain a regular place at Eastbourne Town. He took his spot next to the dugout along with a few of the other old Lewes players trying to persuade Ibbo to give them a game in the style of Yosser Hughes. And so we move onto the actual game. In all honesty I cannot remember alot about it. Catching up on the news of the club, the take over and further plans for the Rook Inn took up most of the time in the first half. Worthing came closest to scoring, hitting the bar in the opening minutes of the game. After a brief interlude in the bar, we emerged for the second half. Or so we thought. 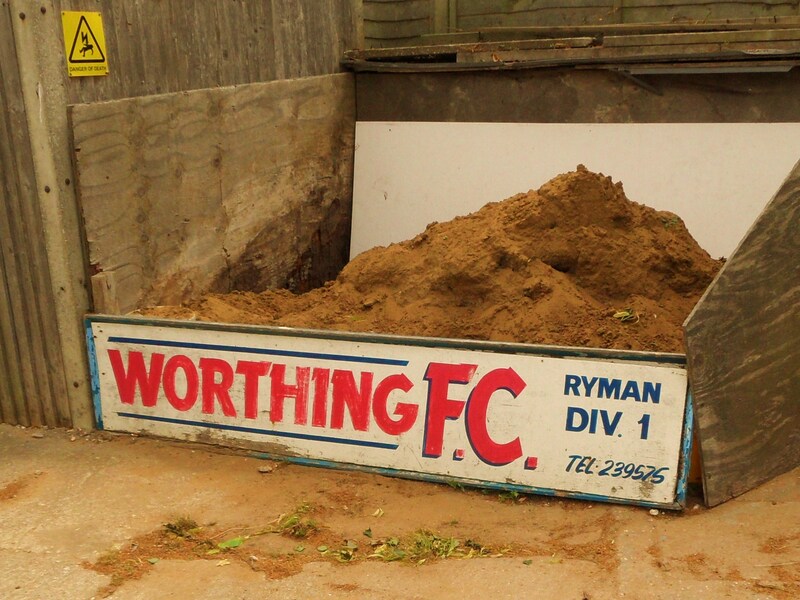 The Worthing team had been replaced in its entirety not just in terms of the players, but also their kit. Gone was the all red strip and replaced with an all blue one. Obviously the new manager, Chris White, was unhappy with the kit being lost amongst the background of the crowd a la Sir Alex Ferguson. It didn’t really do any good. This was a first work out for both teams although Lewes did show some nice “plinky-plonky” football at times as if it was like watching Spain. To add even more confusion to the events the red ball made an appearance. This was supposed to be a “limited” edition version of the Rymans ball just brought out for Red Nose Day. Based on the way these leagues are run, expect a fine for a breach of some sub-rule or regulation somewhere Worthing. There is a story about Lapland and Poles but I will leave that one for Danny Last to explain. It was a welcome return to Lewes though and with my new found “football freedom” I was going to enjoy the next nine months, come rain or shine. More photos from the day can be found here.